Another greentech IPO aspirant with massive VC and DOE loan funding, negligible sales, big losses, and uncertain costs. And beware the desert tortoise, my son, the jaws that bite, the claws that catch. BrightSource Energy just filed for a $250 million initial public offering. Here's a link to the S-1 document filed with the SEC late on Earth Day. The big question is: Do public markets and institutional investors have the stomach for a low-revenue, non-profitable, capital intensive energy firm with a technology unproven at scale -- plus, a tortoise problem? To recap: BrightSource (BSE) is a utility-scale solar thermal player with massive funding from private equity sources and U.S. DOE loan guarantees. BSE is using an air-cooled "power tower" architecture in which vast arrays of mirrors or "heliostats" focus sunlight at a central elevated boiler, producing steam and powering a turbine. Late last month Alstom, the French power plant firm, invested $201 million into BrightSource -- bringing the firm's total VC funding to $530 million. Separately, BrightSource has secured substantial sums for their flagship Ivanpah project. 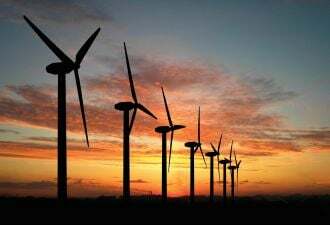 With a total project cost of $2,180 million, the US DOE Loan Guarantee program is to provide loans worth $1.6 billion, NRG has committed up to $300 million in equity, and earlier this month Google committed $168 million to BSE's Ivanpah project. The balance will be contributed by BSE and Bechtel. BrightSource has signed 14 power purchase agreements (PPAs) to deliver approximately 2.6 gigawatts of installed capacity to two of the largest electric utilities in the U.S., PG&E, and Southern California Edison. 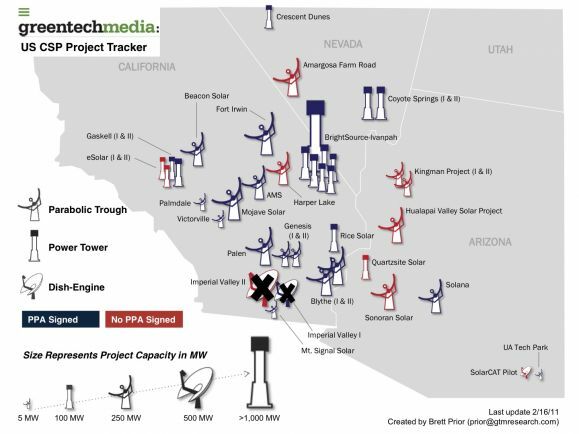 Three of the PPAs are associated with Ivanpah, five have been approved by the California Public Utilities Commission (CPUC). BSE estimates this as $4 billion of revenue opportunity through sales of their systems. Ivanpah is the first project, comprised of three concentrating solar thermal power plants on a 3,600-acre site in California’s Mojave Desert. A controlling interest in the equity of Ivanpah has been sold to a group of investors led by NRG Solar. When commissioned, Ivanpah will have a gross installed capacity of 392 megawatts and a net output of 370 megawatts from a total of 173,500 heliostats. 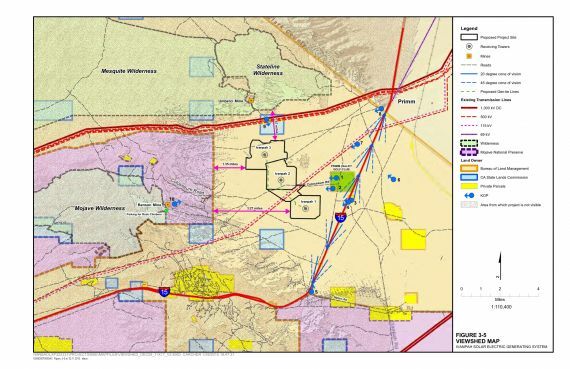 According to the S-1, BSE has a development site portfolio of approximately 110,000 acres under their control in California and the U.S. Southwest, with the potential to accommodate approximately 11 gigawatts of installed capacity. Two California sites are currently in advanced development: Rio Mesa Solar (6,600 acres) and Hidden Hills Ranch (10,000 acres). BrightSource has lost a cumulative $177.3 million since its inception with debt and financial obligations totaling $1.8 billion. The firm reported a net loss of $71.6 million on revenue of $13.5 million in 2010, a net loss of $43.8 million on revenue of $11.6 million in 2009 and a net loss of $44.6 million on revenue of $7.1 million in 2008. Total revenue for the firm over the last three years was $32.2 million. Most of this relatively modest revenue (more than $23.1 million) comes not from the power generation business -- but from Enhanced Oil Recovery (EOR) applications. BSE signed a contract with Chevron in 2008 to provide a 29 MWth EOR facility in Coalinga, California, with the project scheduled to begin operations in the second half of 2011. The Coalinga project was entered into at a loss by BSE. EOR increases production from heavy oil reserves. According to BCC Research, the global market for EOR technologies was $4.7 billion in 2009 and is expected to grow at a 5-year compound annual growth rate of 28 percent to $16.3 billion in 2014. According to the S-1, VantagePoint Venture Partners is the majority controlling interest in Brightsource. VantagePoint holds 24.9 percent of BrightSource’s stock, Alstom has a 17.8 percent share, Morgan Stanley has a 10.5 percent share, and Draper Fisher Jurvetson owns 6.7 percent of the company. The company has had five funding rounds and the D round in mid-2010 was a "down round." Will the CSP PPAs following Ivanpah flip to thin film PV or c-Si as has already happened with the eSolar and Tessera projects? The Ivanpah plant, slated for completion in 2013, has been the target of lawsuits by environmental groups despite approval of the project by both the Department of the Interior and the state of California. To mollify some objections, BrightSource has already scaled down the size of the project as part of the environmental mitigation process. BrightSource has had to mitigate their environmental footprint to contend with the desert tortoise by avoiding long-term impacts to 433 acres of habitat, as well as providing additional area for tortoise relocation within their home range. These 433 acres of habitat would remain available to tortoises for foraging, cover, and other life cycle requirements. While it is unknown how many tortoises would be in this area at the time of construction; three of the 20 live tortoises observed within the project boundary during the 2007 and 2008 surveys would be avoided, resulting in the need to relocate about 15 percent fewer tortoises. At a minimum, 17 existing burrows in this area would also be preserved. Here's a link to a Biological Mitigation Document involving desert tortoises, rare plants, soil, and visual impact. 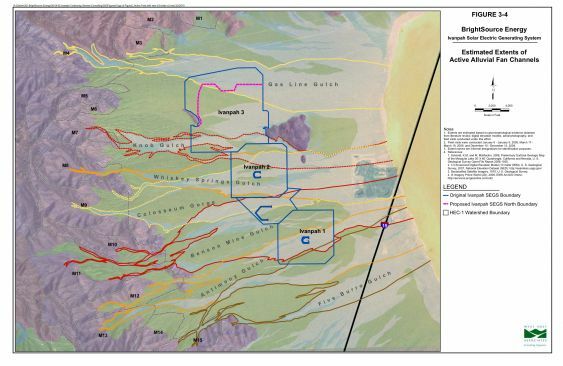 Ed Gunther's sleuthing reveals that Ivanpah 2 and 3 have had fence construction and further surface disturbance suspended because more tortoises have been found than anticipated. (Link here). This would seem to be a big problem -- one that is not mentioned in the S-1. I would wager that BrightSource CEO, John Woolard, had not intended on being an expert on tortoise burrows when he first embarked on this enterprise. "The primary maintenance activity for solar thermal projects using our systems will be the routine and continuous washing of reflective mirror surfaces. We anticipate each mirror may need to be cleaned every two weeks to prevent a buildup of dust which would significantly degrade the system performance. Mirrors will be washed at night by a dedicated crew using specialized mobile equipment. A truck is being designed that will bring purified water simultaneously to a number of mirrors. We are still designing and testing the specialized equipment to be used in this process. If the mirror washing equipment and process are not effective, actual operating costs may be substantially higher than forecasted or total electrical production may fall short of estimates." The S-1 is not very forthcoming about the pricing that has been negotiated for these PPAs. This document from PG&E states that "The price of procurement under [Ivanpah] Projects 1 and 2 is equal to or less than the applicable 2008 MPR (Market Price Referent). (2008 MPR numbers can be found here.) A 25-year PPA starting in 2012 shows a 2008 MPR of $0.1251 per kilowatt-hour. The S-1 also doesn't go into detail about the amount of transmission-buildout required for that "11 gigawatts of installed capacity." GTM Research forecasts the CSP market to grow from $3 billion in 2011 to over $10 billion by 2013. But beyond 2013, the situation is much less rosy. 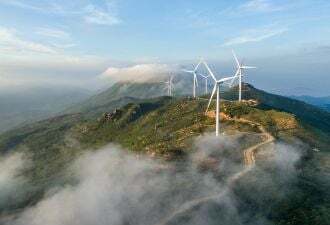 With 2011 installations slated to reach 472 megawatts and 2012 forecasted to exceed 700 megawatts, the first wave of global project commissionings brings optimism. However, this optimism will increasingly be mitigated by the competitive, long-term threat posed by solar PV, which continues to reduce its installed cost faster than CSP. 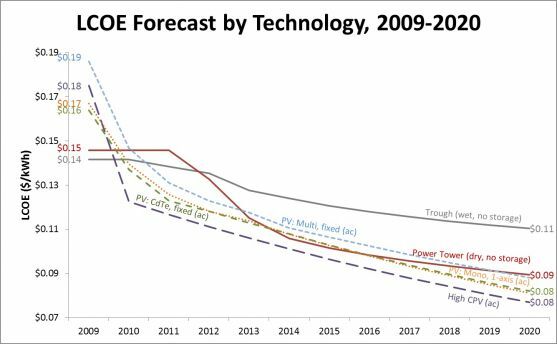 More details on this forecast and a detailed analysis of the market in the CSP 2011: Technology, Costs and Markets report. 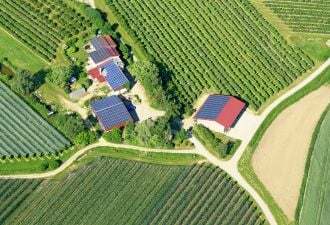 “Of the total 13 gigawatts of solar projects in the US with PPAs, 47 percent are CSP, 51 percent PV, and 2 percent are CPV,” said Prior. “But recently, all the competitive bids for new solar projects have been going to PV and CPV. If CSP companies want to maintain their share of the utility-scale solar market, they will need to bring their costs down, allowing them to compete with the sub-$0.10 per kilowatt-hour bids that PV developers are submitting. Power tower is one technology that has a lot of potential for cost reduction. Will BirghtSource and SolarReserve be able to realize that potential?" Unprofitable startups go public all the time. Statistically speaking, unprofitable companies show a trend of shooting out of the gate with strength but fading in the long run, according to this analysis from Business Insider. This makes for favorable VC exits from essentially weak companies. If BrightSource were to follow that pattern, the winners would be the VCs, and the losers would be the new investors picking up shares at the IPO. Like any pattern, there are exceptions. Yahoo! was unprofitable at the time of its IPO, and new investors still did alright. So, should you invest your nest egg in BrightSource shares? Documents from the environmental mitigation process.